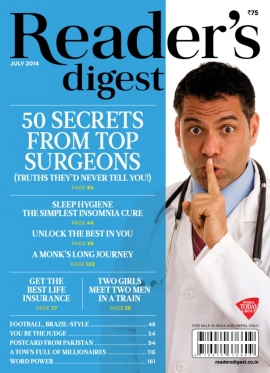 It seems that this late comer issue of Reader’s Digest India – July 2012; concentrates on the LAUGH (as the cover page suggests). It is very true, the hard you train the better you perform. This segment focuses on a remarkable problem behind the good solution. Mass transport across the city is what we are taking. The city buses are boons for the people, it not only provides a cheap way to travel but also makes less damage to the environment. Its not all good though, there are problems associated with it. The drivers of such buses are driving them dangerously in a lot of cases (of course, not all). This is the problem of almost all metro city over India, be it Mumbai, Chennai, Ahmedabad or other. There is a photo clearly showing a bus moving ahead by ignoring RED signal (which meant to stop). We definitely need disciplined driving in mass transport, with responsible behavior by all its drivers. Have you heard about Labyrinths? Read right here right now section to know more about the same. We also got to see some unusual photos of home/workspace in addition to some cool tech gadgets in the segment. The Stranger In The Mirror (Vintage) is a book by Jane Shilling which speaks a woman’s point of view. In the social structure of west the people in the sixties are also in good shape and/or dating and marrying too; which is not the case in other cultures like India where the culture is family oriented and people after certain age are concentrating more on the parents, siblings and mainly children and their stuff, after a certain age. This book is a kind of memoir that tickles the second half of a life from a woman’s perspective. The book might give you a feel that it is for a little mature people (and not for the youth). Read detailed reviews inside the magazine. The other book reviewed this month is Women Who Run With the Wolves by Clarissa Pinkola Estes. It is worth to note that the author is a Ph.D. and the book stayed around 145 weeks on the NY Times best seller list. The theme of the book is using folklore, myth and fairy tells to help women reclaim their inner strengths. Bittu Sahgal brings in the information about Gorillas living in the forest of Rwanda. Working hard is really a good thing. It helps one to achieve his/her goals in almost all segments of the life. But there is a proverb telling that too much of anything should be avoided. Working too hard makes to workaholic which affects not only health but the relations as well. When it start heating back to you, you should stop and rethink and reorganize your priorities and the amount of efforts. A small article which doesn’t go into depth but gives you briefs about 10 signs that you work too hard. The word power section comes with the words having Q.
Laughter to English Dictionary is an article with 42 words and over 100 jokes. It is intended to expand your humour vocabulary. An article with photos, illustrations and linguistic stuff by Andy Simmons. The article also shows how the technology, especially the IT and Internet have affected our life (A joke for example is: “I saw your arrest video on YouTube. You look so thin!”). Actually there is lot more in this article which is worth a read. Olympics is about to start and it is in the headlines at almost every newspaper, magazine, TV channel etc. So how it can be missed here? Olympics Humour is there for you. You will enjoy the collection of some of the most loved cartoons published in RD so far. They are really funny (and punchy too). RD have started a new theme to re-published the story from the past. This time they brought Letter In The Wallet; which is actually about a man’s search for the writer of a 60 year old message which leads him on an extraordinary journey. This story was originally published in December 1985 issue of Reader’s Digest India. In addition to provide an interesting study about the symbol PI, there is an article titled wonderful wordsmith. The article is the journey of a (then) young journalist to be a noted figure (now) inter-language thesaurus. He had won a number of awards like Shalaka Sanman, the highest honour of Delhi Hindi academy; Maharashtra Bharti Akhil Bharatiya Hindi Seva Puraskar; Kendriya Hindi Sansthan’s Subramaniyam Bharti Award and more. It is inspiring journey. Polar bears cover their noses when stalking prey. Real life drama segment brings the story titled “Alone in a sinking yacht” by Jos Versteegen. It is the story about a fellow, who was taking a trip in his yacht. It was all smooth till it took a dangerous turn. Now the fellow is on his own to get out of the trap. A good read for thriller lovers. Five Stupid Internet Reactions: This article is about the reactions of readers for the news stories, on Internet. Many of the responses to online articles are reasoned and articulate, but there are found others too. The writer just assumes that if some of the biggest news stories are published in the time of the Internet (or otherwise; if the Internet is there since more than a 100 years); what possible responses we could have seen for the same. The stunning photograph you see in the “see the world differently” is really amazing! You definitely need to turn the page over to know what it is. We just give you the hint: The photograph is of Les Mees solar farm in Alpes-de-Haute-Provence region of France. Remember the war films and its meaningful dialogs and songs? Remember the philosophical stuff about the same. Sometimes you need to know it to believe it. In 1984 an Iranian soldier have saved his enemy’s life in the battlefield. After twenty years, the favor is repaid!!! Read the tale “Blood Brothers” in bonus read section. Overall a balanced issue with highs and lows. Though I personally have expected a better one. The initial segment of the magazine is not that much fascinating the but the second half is fantastic. Rather than paying for something meaningless; the issue is a quality read to go for.